Congratulations to Pat S., Jackie M. and Mary C., the winners in Carla's giveaway. Thank you to all who participated! 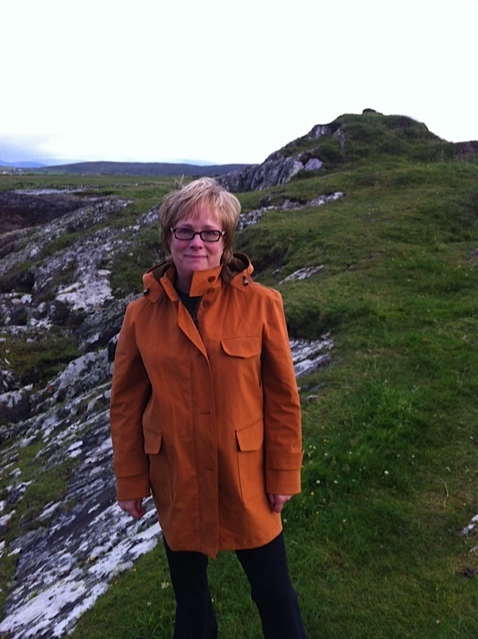 NY Times and USA TODAY bestselling author Carla Neggers joins us today with a little taste of Ireland. It's almost August? Where did July go? I swear I can smell snow in the air! Okay, that's an exaggeration. It's been a fun, busy summer of writing, traveling, gardening and—best of all—getting ready for our daughter's second baby (a girl! ), due in mid-September. Little Leo is now three, into Thomas the Tank Engine. We were in Ireland when he was born, three weeks early. We got the call at the Hertz car rental counter at the Shannon airport as we rushed home. We were in Ireland again in July, walking on lanes in the tiny bayside village where Leo's and his soon-to-be-born baby sister's paternal great-great-grandfather was born. They and their dad still have family there. It's an incredibly beautiful spot. I love to let my mind wander as I walk for miles in the Irish hills. In fact, Finian Bracken, the Irish priest and whiskey expert who appears in SAINT'S GATE, the launch book of my Sharpe & Donovan series, and now HERON'S COVE, came to life during my time in Ireland. Finian ends up serving a parish in a small Maine fishing village and becoming friends with Colin Donovan, an FBI deep-cover agent, and Emma Sharpe, an FBI art crimes expert and former nun. With three Donovan brothers and an Irish priest watching her, Emma Sharpe choked back her sample of the smoky single-malt Scotch—her sixth and last tasting of the night. "Intense," she said, managing not to slam the tulip-shaped nosing glass on the table and grab the pitcher of water. Give it a few seconds. She was an FBI agent, after all. Tough as nails. She smiled at the four men. "People pay to drink this one, huh?" "Dearly," Finian Bracken, the Irish priest, said. "You're not one for a heavily peated whiskey, I see." Emma tried to distinguish the other flavors of the sample—spices, fruits, whatever—but only tasted the peat. "I don't know if I'm one for a lightly peated whiskey, either." A cold wind penetrated Hurley's thin walls and sprayed the old windows with salt water and rain. The restaurant, a fixture on the Rock Point harbor, was basically a shack that jutted out over the water. Now only a few lights penetrated the dark night and fog. Finian had organized the impromptu tasting, setting up on a back table away from what few diners were there on a windy, rainy late-October Friday. He and Michael, Andy and Kevin Donovan were already gathered over a half-dozen bottles of highend whiskey when Emma had arrived in southern Maine an hour ago, up from Boston and her job with a small, specialized FBI unit. Only Colin, the second-born Donovan, wasn't in Rock Point. Mike was a Maine guide, Andy a lobsterman and Kevin a state marine patrol officer, but, like Emma, Colin was an FBI agent. Not like me, she thought. She specialized in art crimes. Colin was a deep-cover agent. He'd left his hometown a month ago, pretending to return to FBI headquarters in Washington. The true nature of his work was known to only a few even within the FBI, but his brothers had guessed that he didn't sit at a desk. Initially he'd kept in touch at least intermittently with his family and friends—and Emma—but for the past three weeks, no one had heard from him. The silence was far too long, not just for his family and friends but for the FBI. Carla would like to hear from you. Stop by and say hi, or share a tale where you have been away and missed an event back home. Carla will be awarding three prizes, a hard cover of her new release, HERON'S Cove, a paperback of SAINT'S GATE and a T-shirt! Giveaway ends 11:59pm EST July 31st. Please supply your email in the post. You may use spaces or full text for security. (ex. jsmith at gmail dot com) If you do not wish to supply your email, or have trouble posting, please email maureen@justromanticsuspense.com with a subject title of JRS GIVEAWAY to be entered in the current giveaway. This giveaway is for US and CANADA mailing addresses only. When your safety depends on living a lie. . .
After escaping certain death, deep-cover agent Colin Donovan is back home on the Maine coast with his new love, FBI art crimes expert Emma Sharpe. Then Tatiana Pavlova, a London-based jewelry designer, arrives in Heron’s Cove, asking for Emma’s help–a prized collection from a lost era of Russian opulence, decadence and rare beauty has resurfaced, and Tatiana warns Emma it’s about to be stolen again. And Colin realizes his nightmare isn’t over. It’s just begun. And everyone you love is a target. . .
Emma guards her past closely, and Colin is determined to unlock her secrets. As they investigate the mysterious collection and the equally mysterious Tatiana, they confront their greatest challenge. Now they must count on their expertise–and each other–to outwit an enemy who wants to destroy them and everyone they love most. Hello! I'm looking forward to reading "Heron's Cove". Keep up the wonderful writing! Whoo! So stoked to read this one! Omgosh! I been "waiting" on this one! Been reading "short stories" just so I don't get "into" another series.. LOL I can't wait to read more on these characters, especially Finian .... 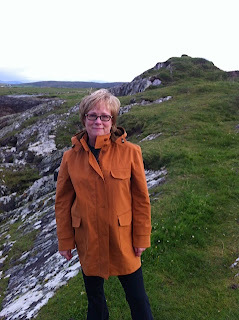 I love to follow Carla's pictures especially when she is over in Ireland. Of course love all of Carla's books/stories! Thanks for stoping by Carla and thanks for a another great interview/contest! I must admit that I love books set in Ireland and Scotland. I am half Italian, 3/4 Irish and 1/4 Scottish. I have been blessed to visit Ireland and Scotland although, unfortunately, the last time was many years ago. I love both countries but of all the places, the Highlands of Scotland in the Fall is breathtaking! Anyway, I love your books but I must admit, I have yet to read "Heron's Cove" and cannot wait to do so. Please keep your books coming! Just recently discovered Carla Neggers and can't get enough. Been reading ever since I retired 15 years ago. I'd love to win Heron's Cove. I get my books mostly from the library. And have to wait for a favorite sometimes. Thanks and keep up the good work! Well, I did live 'away' for a few years and missed several home and family events. Other times, I simply had to work. Carla, I sure do hope to see you in South Portland very soon! Got a touch of Irish in me and enjoy reading romance books with the Irish flare. Look forward to reading Heron's Cove. Thank you for holding the contest. Love your books! -- Linda A.
I enjoy your books so much. They take me to places I long to go to. Your books are terrific~! I've read the Cold series and have the Whisper waiting to be read. Would love to win a book in the new series. How have I not read these books yet? I must run to the book store now, again. I would love to win one of your books! Am eagerly awaiting your newest book. I'm a huge Carla Neggers fan! I like how every book takes me to the place; the details are great. Congratulations on the release of Heron's Cover. I absolutely love your books. Once I gain a copy and read it, i cannot seem to part with it! I have them all put in one special area! Thanks for taking the time to write all your wonderful books! Oh and I e-mailed you my e-mail address! I'm thrilled and wait impatiently for ALL your new releases - I've already read all the older ones! I wish you had them put into movies for Lifetime showing!! How wonderful this would be to see characters come to life. Thanks for the info, Dave! I was "home" on Saturday for my niece's bridal shower. Here is my email...:veeriggs@aol.com ..Come back to AZ. Congratulations on the book! This sounds like a good series. Looking forward to reading the series! Am trying to catch up on your novels! Congratulations on this series, sounds great. Congrats on the new release, Carla. I wish miss my cousin's upcoming wedding, but my mom will make the trip and represent the family. Oh Ireland... one day I will see it! I have always loved your books and I am looking forward to Heron's Cove as well. I finally get to correspond with you. I have seen your name over the past year many times as a wonderful author. Please enter me in your draw. I would very much like to read one of your books! Love the trailer - can't wait to read Heron's Cove! I'm looking forward to adding Heron's Cove to my collection of your books - I love each and every one of them! The event that I was away from home for (actually out of state on a major software conversion) was my daughter's 7th birthday. Twenty some years later and she still doesn't let me forget it!! Heron's Cove sounds great! I'd love to read it. I'd also love to travel to Ireland, I imagine it's beautiful country! Well, maybe some day. I always feel so connected to your books; I live in Maine, love to visit Vermont and can't wait for my visit to Ireland - hope to find distant relatives! Have read and enjoyed all of your books, and can't wait for Heron's Cove! Thanks for the great giveaway and congrats on the newest release! I've always wanted to read Carla's books... they sound so good! I love your books especially the ones set in Ireland. Would love to visit the country some day. Thanks for the chance to win such great books. The event I missed was when my only daughter started school. I had to take my husband to hospital a state away and my dear mother got the joy of sending her off for the first week. I have not heard of these books. I would love to read them! My dream is to go to Ireland. Glad to hear you enjoyed your trip to Ireland! One day I hope to visit too! I love your books and thanks for a chance to win a copy of "Heron's Cove"! Would love to read this series! Thanks for the great excerpts. Added them to my list.